– Senate Pro Tempore Joseph Scarnati, whose daughter had severe disabilities. You can support Senator Martin’s resolution by contacting your State Senator and asking for their co-sponsorship and support of SR174. Want an easy way to send an email, even if you don’t know who your State Senator is? Click here to access our Citizen Action Center to automatically send your State Senator an email. Children and individuals with Down syndrome are valued members of their families and communities, and make meaningful contributions to Pennsylvania every day. 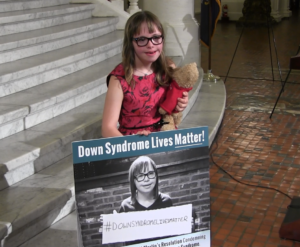 With current laws like Chloe’s Law, which provides Pennsylvania parents and families with relevant information upon the prenatal diagnosis of Down Syndrome, along with this proposed resolution by Senator Scott Martin (Senate Resolution 174), we can continue to advance Pennsylvania as a place where every individual is protected, respected and valued. Beautifully said Kurt and Chloe. I wish people would understand this idea that the world needs more people with the characteristics that Chloe has, not antifa and uprisings! Thank God for people like Kurt and Chloe who advocate for the most vulnerable among us. I am proud that they reside in my community and I pray that their efforts will bring many others to reevaluate their attitudes toward the issue of the value of life and the critical importance of it’s protection.